New book by Dr. Kathleen Kendall-Tackett describes the role of domestic violence in postpartum depression. October is Domestic Violence Awareness Month. Domestic violence during pregnancy or the postpartum period is a key, but often unacknowledged risk factor in depression in new mothers. A new book, Depression in New Mothers 3rd Edition, examines research on the role of domestic violence and other types adult adversities on perinatal depression. According to recent studies, domestic violence increases women's risk of postpartum depression by 3 to 7 times. Domestic violence during pregnancy or postpartum dramatically increases the risk of depression and posttraumatic stress disorder in new mothers. 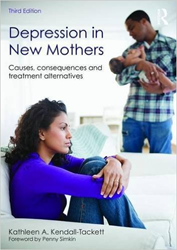 A new book by Dr. Kathleen Kendall-Tackett, Depression in New Mothers 3rd Edition, describes these recent studies that find that domestic violence during pregnancy increases the risk of prenatal and postpartum depression by 3 to 7 times. October is Domestic Violence Awareness Month. According to Dr. Kendall-Tackett, "violence against women has always been an important risk factor for depression in perinatal women. Until recently, most of this research has focused on women's history of childhood abuse. More recent studies have focused on current violence, especially violence from intimate partners. For example, one recent review of 67 studies found that violence during pregnancy increased the risk of postpartum depression and anxiety by 3 times, and the risk of prenatal depression by 3 to 5 times. In a study of Latina women, 44% of those who were abused during pregnancy were depressed. Violence during pregnancy was the strongest risk factor for postpartum depression. Partner violence was particularly harmful when combined with other types of adversities, such as history childhood abuse. In immigrant women, partner violence increased the risk of depression by 7 times. If we really want to lower women's risk of depression in pregnancy and postpartum, we need to acknowledge and address the violence that many of these women experience." Dr. Kendall-Tackett is a health psychologist who has studied the effects of family violence for the past 33 years. She is the author or editor of 34 books on family violence, trauma, and maternal mental health including Depression in New Mothers and Psychology of Trauma 101 (co-authored with Lesia Ruglass). She was also co-edtor of the book, Intimate Partner Violence. Dr. Kendall-Tackett is also editor-in-chief of the peer-reviewed journal, Psychological Trauma. Dr. Kendall-Tackett is the 2016 recipient of the Outstanding Service to the Field of Trauma Psychology award from the American Psychological Association. Depression in New Mothers, 3rd Edition is available on Amazon or from Praeclarus Press, a small press focusing on women's health based in Amarillo, Texas.